"Winter is an etching, Spring a watercolor, Summer an oil painting and Autumn a mosiac of them all." 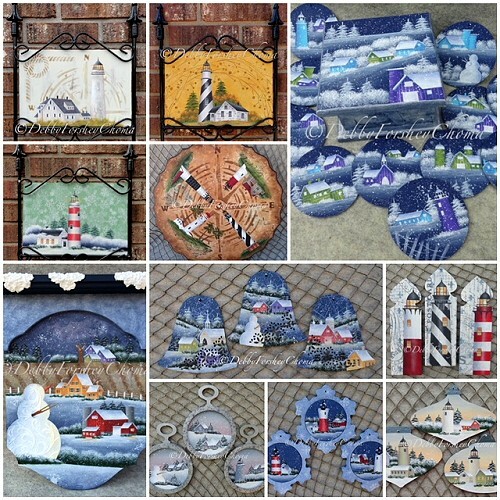 I enjoy designing especially lighthouse scenes, seascapes and landscapes in different seasons; which are available here on my new site in epackets, pattern packets and books. 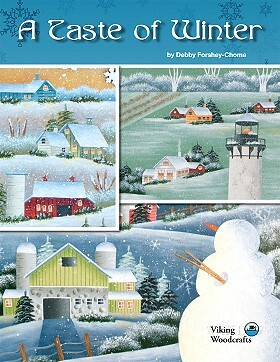 Quite a few of my designs call for Debby's Texture brush; which is available here on my site. I often hear students not pleased with the results of their foliage, snow, etc. Most deerfoot brushes are made of synthetic hairs; which results in gobbs on your surface. My Texture brush is made of hog bristles with the results of an airy effect on your surface. Don't miss checking out Debby's Originals, I will be periodically adding painted treasures that are looking for new homes. I also travel teach throughout the United States, so if your chapter or painting group would like to have me come, please email me for more information debby@debystouch.com. Also as one of the Royal Ambassadors for Royal & Langnickel Brushes and a DecoArt Artist, I can offer expense support to chapters for their seminars. Be sure sign up for my newsletter; which I will email out periodically with tips, worksheets, specials, recipes, etc.